* Natural hard maple helps us create an amazingly durable child's easel, right here in our Minnesota woodshop!. 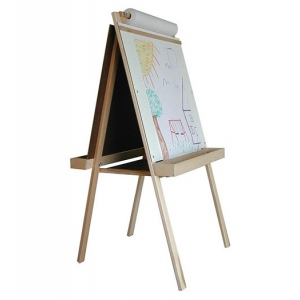 * The top mounted paper holder included with this easel positions a roll of art paper above the art surfaces, where it is very accessible. * This feature allows paper to stay in place even when the easel is folded for storage. 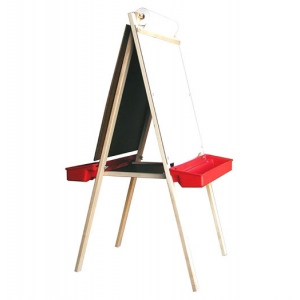 * A center storage platform holds the easel securely open during use (a solid A-frame is tough for even the most "creative" children to push over) while pivoting it up and out of the way allows an adult to fold the easel after simply removing one paint tray. * The large 24" x 24" art surfaces are available in Whiteboard, Green Chalkboard or Washable Magnet Board. * 47-1/2" high; 20 lbs. (paper roll sold separately).